BANGUI – A peace deal between the government of the Central African Republic (CAR) and 14 rebel groups has been struck after talks in Sudan, officials say. The deal was announced by the UN mission in CAR, known as Minusca, and the African Union (AU), which both sponsored the talks in Khartoum. Details of the agreement have not been released and analysts caution that previous peace deals have all collapsed. CAR, which has been unstable since gaining independence from France in 1960, was plunged into turmoil in 2013 when Muslim rebels from the Seleka umbrella group seized power in the majority-Christian country. A band of mostly Christian militias, called the anti-Balaka, rose up to counter the Seleka. Thousands have been killed in the violence and more than one million internally displaced. An estimated 570,000 people have fled abroad. 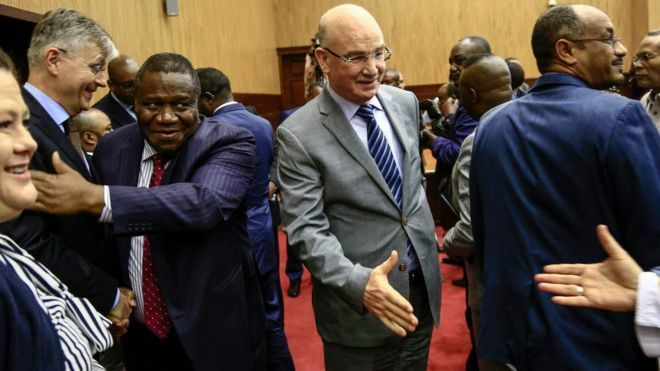 “We have finalised a peace agreement in Khartoum, enabling the people of Central African Republic to embark on a path of reconciliation, agreement and development,” Mr Chergui tweeted on Saturday. The government of President Faustin-Archange Touadera also confirmed the agreement on Twitter. “This agreement should be initialled tomorrow (Sunday) and its signing will take place in Bangui in a few days,” the tweet added. A spokesman for the FPRC armed faction said consensus had been reached on sticking points which included an amnesty for militia fighters and an inclusive government. “We were able to agree on what is essential for the Central African Republic – peace. We hope this agreement will bring back social cohesion to the country,” Abakar Sabom said.